The 14th annual Women of Influence Breakfast Presentation was held Thursday, November 10, 2016 at Prairieland Park. 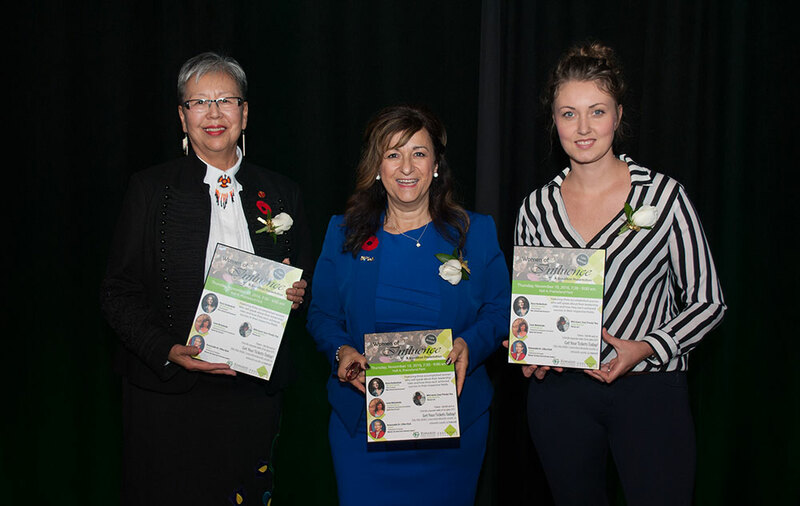 The sold out event hosted 395 members of the business community and students in celebration of women leadership and achievements. The morning started with special guest Zoey Roy who delivered her powerful spoken-word poem “Women Are”. Our first Woman of Influence, Elysia Vandenhurk, COO and Red Seal Chef at Three Farmers, shared insight on how she continues to persevere with Three Farmers and what her strategy and beliefs are around work/life balance. As she spoke on her topic “Take a Breath and Persevere”, she reminded the audience not to worry about finding the perfect balance and to embrace the chaos. Carm Michalenko, Executive Director of the Saskatoon Community Foundation spoke on “Igniting Your Passion.” She captivated the audience with her journey from private, public to nonprofit sectors, sharing the moments that ignited her passion. She learned how to stop asking “why me?” and that greatness lies on the other side of fear. Our final Woman of Influence, Senator Lillian Dyck spoke on “Women: No Choice but to Become Leaders”. Senator Dyck shared the challenges she faced on her journey to becoming the first female First Nations senator and first Canadian born Chinese senator and how she was able to adapt. Ending with a note of humor she inspired the audience to continue to break down barriers in their communities. The event also recognized recipients of the Women of Influence Award, a scholarship intended for business students (male or female) who are making progress towards degree completion and are single-parents of dependent children. Kacey Beaudry, a fourth year Management major, and Nancy Zimmerman, a fourth year Human Resources major were selected to receive the scholarships. Thank you to our generous event sponsors for their help in making the 14th Annual Women of Influence Breakfast a success: ICR Commercial Real Estate, Global Saskatoon, Moxie’s Grill & Bar, Persephone Theatre, Prairieland Park, Radisson Hotel Saskatoon, Rawlco Radio, Select Roses, TCU Place, Trek 2000 Corporation, U of S Bookstore, Wilson Centre for Entrepreneurial Excellence, and Three Farmers.